The perfect wash sponge for any washing job! The SONAX Microfiber Car Wash Sponge is an extremely versatile, 2-in-1 wash sponge designed to tackle any washing job you come across! The long chenille fibers of the SONAX Microfiber Car Wash Sponge are extremely absorbent and facilitate proper foaming, making it perfect for your weekly maintenance washes. The smooth side of the SONAX Microfiber Car Wash Sponge is capable of removing even the toughest of grime and dirt without scratching the paint. The SONAX Microfiber Car Wash Sponge is made with 89% polyester and 11% polyamide to ensure that it is gentle enough for soft paints, while being durable enough to last for years! 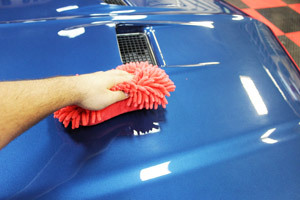 The SONAX Microfiber Car Wash Sponge has a soft, gentle side comprised of long chenille fibers. This side of the SONAX Microfiber Car Wash Sponge has a deep nap that will pull all the debris you are washing off the surface deep into the sponge, making sure it does not come into contact with your paint during the washing process. The long fibers of the SONAX Microfiber Car Wash Sponge absorb more of your shampoo and properly agitate it, maximizing your shampoo’s foaming capabilities. With a foamier wash comes better lubricity and a reduced chance of scratches to your paint! SONAX Microfiber Car Wash Sponge is like having two unique tools in one! 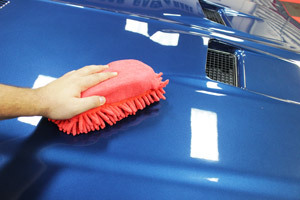 The SONAX Microfiber Car Wash Sponge also has a smooth side with a shallower nap designed to remove the dirt and grime from even the most neglected cars. The short fibers of this side of the SONAX Microfiber Car Wash Sponge are capable of creating much more scrubbing potential than a sponge with a deeper nap. Even though this side of the SONAX Microfiber Car Wash Sponge can tackle caked on dirt with great ease, it still has the same gentle touch you’ve come to expect from microfiber! After use, wash your SONAX Microfiber Car Wash Sponge with warm water and leave to air dry.